As for now we have not seen apt-X supported by any iOS product, and there is not any evidence that Apple wants to support this codec in the near future. So the only way can you get an apt-X wireless streaming music is through some third-party gadgets like this KOKKIA i10s + aptX Bluetooth Transmitter. This apt-X Bluetooth Transmitter is born for 2 missions: 1.Add apt-X codec to your iPhone. 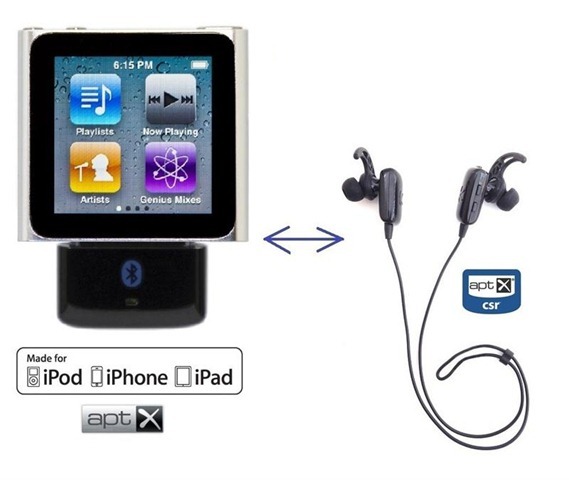 2.Turn your iPod into a bluetooth wireless player with near cd-quality sound. It also has authentication IC chip included for remote feedback controls. 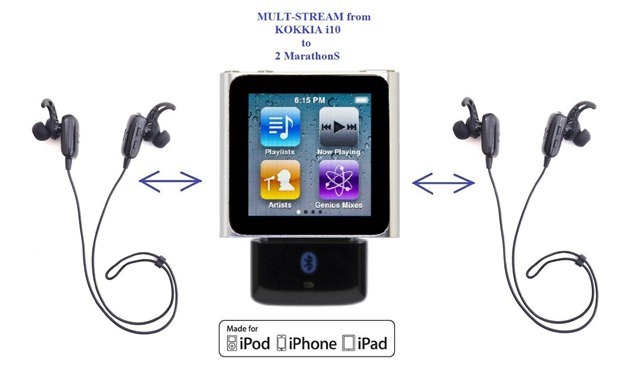 KOKKIA i10s + apt-X Bluetooth Transmitter works well with iPod and iPhone, unlike many other iPod Bluetooth transmitters that are only made-for-iPod. The industrial design of this tiny transmitter perfectly matches your iPods/iPhones/iPads. Apt-x codec is widely used for processing a higher broadcasting bitrate, which is essential for high quality wireless music transmission. It is now the main Bluetooth standard for most Android devices. Unfortunately Apple doesn’t include this feature with its iOS products, even the new iphone 5. And we see no evidence that this tech will be recruited by Apple in this year. 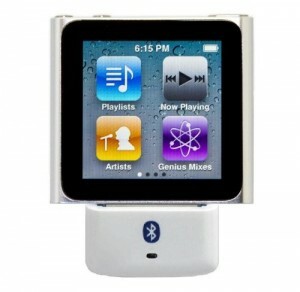 So anyone wants better wireless music with iDevice will have to reach for some additional help from other gadgets. Apt-X transmitter is exactly what we are trying to get. It transmits nearly lossless audio to your Bluetooth headphones or receivers. The outcome is very noticeable compared with iOS’s own bluetooth. High fidelity sound with apt-X only works when the corresponding receiver supports the same codec, otherwise it will automatically switch into the standard Bluetooth SBC mode. KOKKIA i10s is the smallest iDevice transmitter on the market, with or without aptX Bluetooth capability. Its fashionable design has no buttons on the body. That ensures no accumulation of unsightly hard-to-clean dirt in the edges of the button. Being compact and neat this little device will never look protruding when working with iOS devices. Apple’s 30-pin dock-connector port has been a staple of iPods, iPhones, and iPads since the third-generation iPod. While most media players offered simple USB connectivity for data and charging, Apple’s 30-in port offers a slew of functionality: Power, audio-out, playback control. There are some bluetooth transmitter with apt-x has a universal 3.5mm jacket not the 30-pin dock for iOS. There are two main reasons why an Apple fans likes this 30-pin slot. It provides a sturdy connection with better performance. Someone believes the sound through it is better than the 3.5mm jacket. Second this dock slot will provide power to any device connected through it, so they usually have no built-in power supply, which enables a more little size for the final product. KOKKIA i10s + apt-X Bluetooth transmitter includes an Apple authentication chip which will authenticate with iDevices to enable this transmitter some unique AVRCP playback control abilities:Next/Pevious/Play/Pause. That is not possessed by others. iPod classic (80, 120, 160GB). You need a lightning to 30-pin adapter if you want to use it with iPhone5 or iPod Nano 7th gen. This is one of those unusual products that just do what it says it will do, and does it well. This KOKKIA i10s + apt-X Bluetooth Transmitter for iOS device enables Bluetooth on iPod Nano and iPod Classic, gives the option of apt-X CD quality audio on iPhone, iPod or iPad and enhance the audio performance of your iPhone, iPod and iPad. This neat Bluetooth transmitter has a sleek design so it is the best choice for the 6th Generation iPod Nano especially when it’s worn as a watch on your wrist. It’s a little pricey as compare to other iPod Bluetooth adapters, but it’s worth the extra money for the high quality sound and the elegant design. This product is made to meet some special needs. So cool to have such a small device provide so much opportunity in your musical world with your friend or families. It can pair with and transmit sound to 2 separate bluetooth devices such as receiver or speaker. The most interesting way I can think about is share music with your girl friend or boy friend without disturbing others. Or you can set up a virtual surround system with 2 pairs of speakers without annoying wire connections. With this transmitter splitter, you can also watch movies together on HDTV at midnight without worrying about waking the kids! Bought the i10s to connect my iPod classic with a Harman Kardon BTA10. Have been unable to pair the two. Do you know that they are compatible? Thank you for your comment and I am Sorry to hear your problem. I have not encountered this kind of situation. I will ask the author Joseph G Silva for details. Hi! Mossiman. Sorry to hear that i10s has some compatible problem with BTA10. I own this KOKKIA i10s for quite a while and never face any problems related to pairing. Have you ever tried to reset your BTA10 to see what happen? Sometime a single reboot can solve your puzzle.